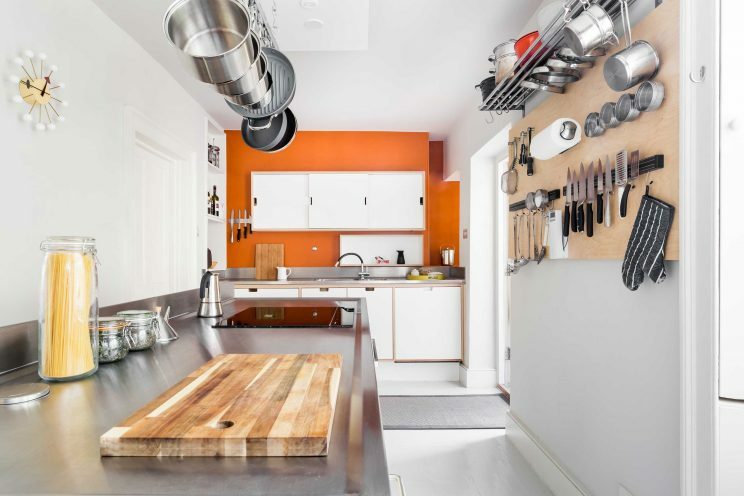 We worked closely with the client to create a really unique yet functional kitchen. 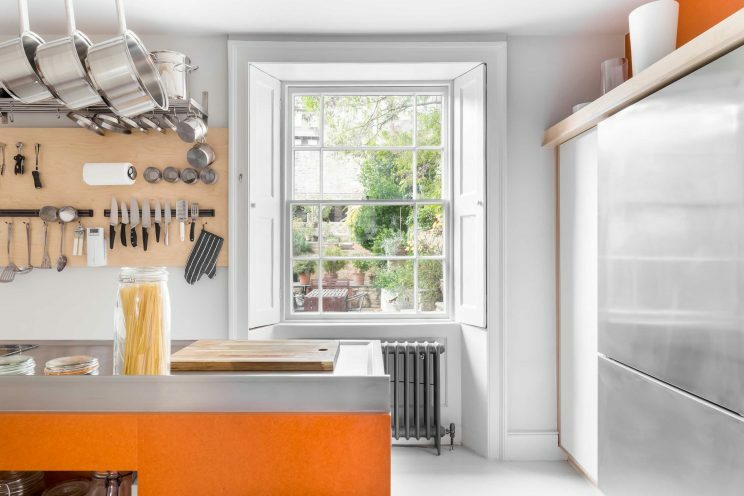 In 2016 we were contacted by a well known architect in the area who was looking to redesign his kitchen in his Grade II listed property. The architect, founder of Architectural Dialogue, had a clear and creative vision for his space, but we spent sometime discussing new ideas and materials to perfect the brief. 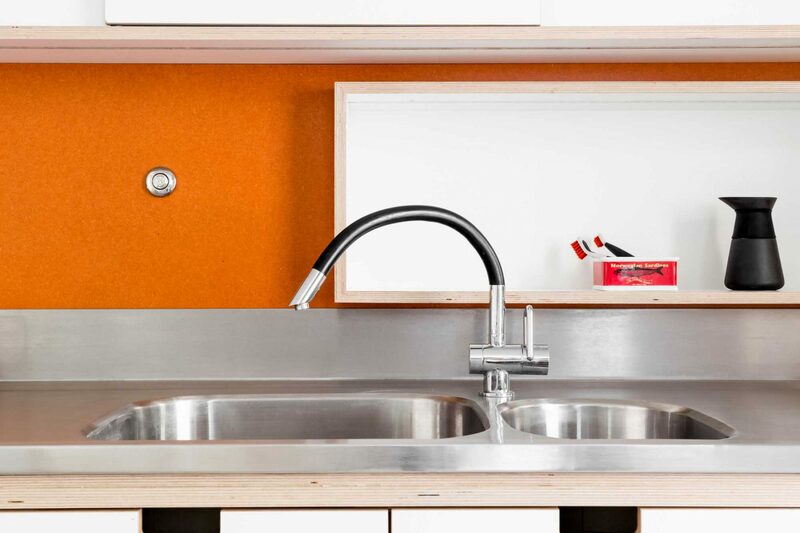 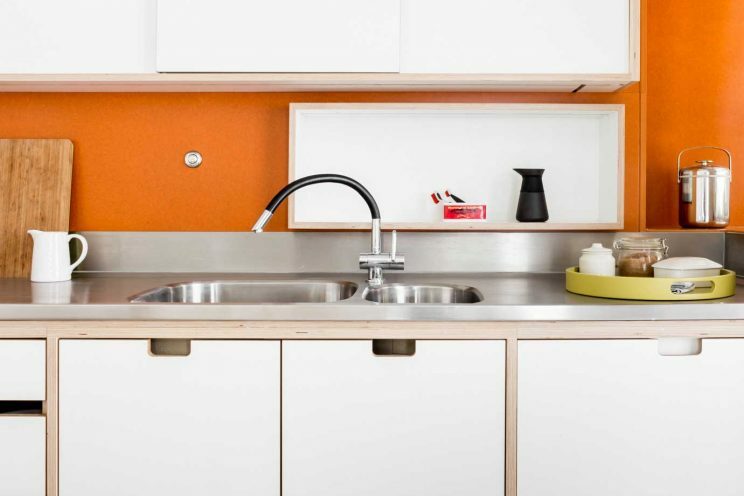 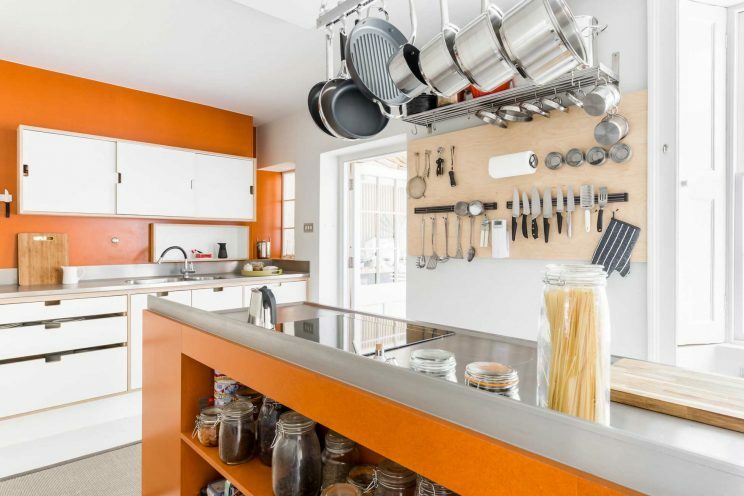 A lot of planning went into the creation of this grey and orange modern kitchen. 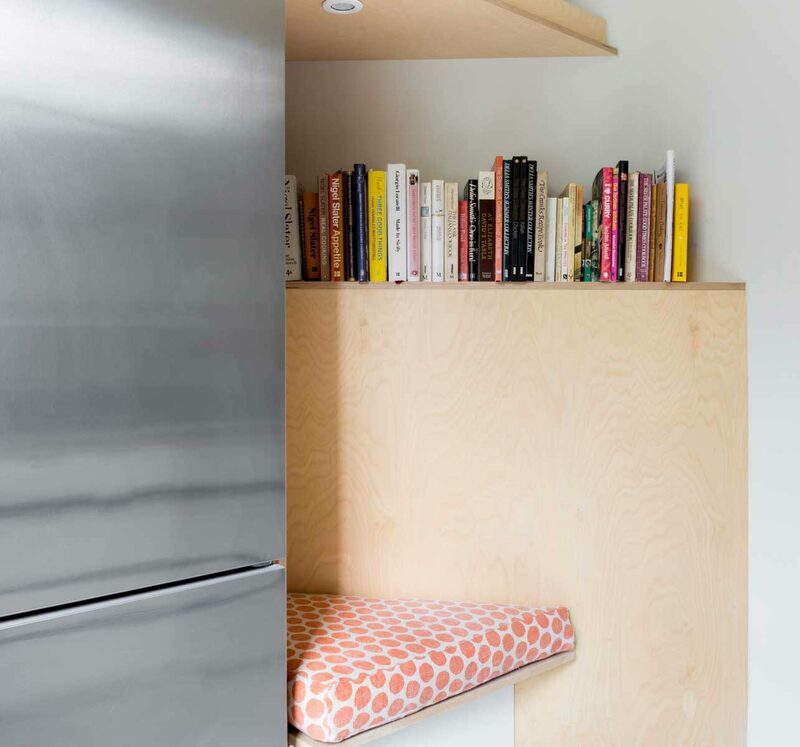 Our client wanted to incorporate really cutting edge materials and we opted for a mix of styles and textures to create an extremely functional but quirky space. 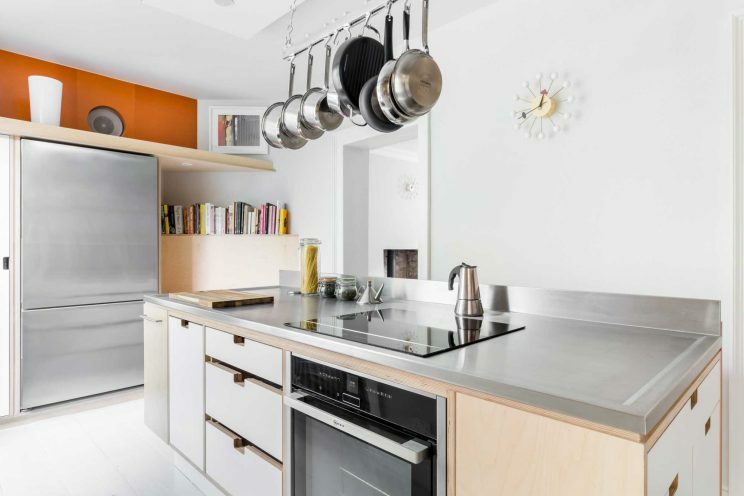 We introduced orange coloured panelling, known as Valchromat, into the design—adding it to the back walls as well as alongside the kitchen island. 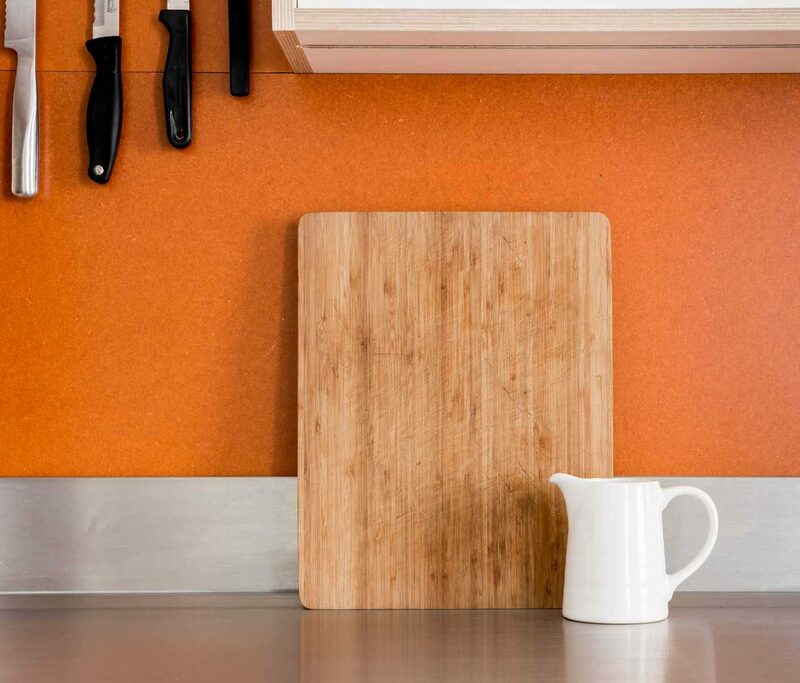 Valchromat is not only extremely durable, making it ideal for the kitchen, but its unique texture and aesthetics make for a bold and playful look. 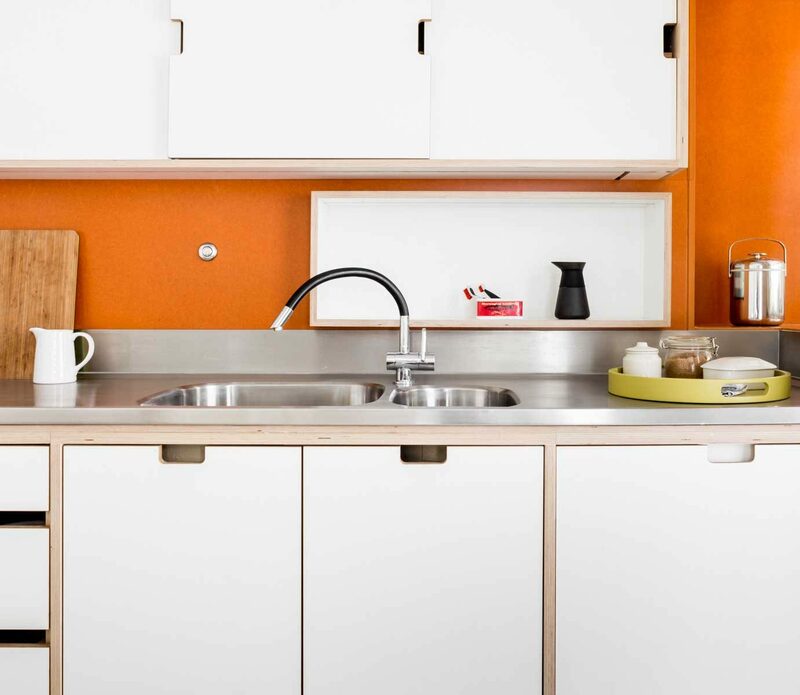 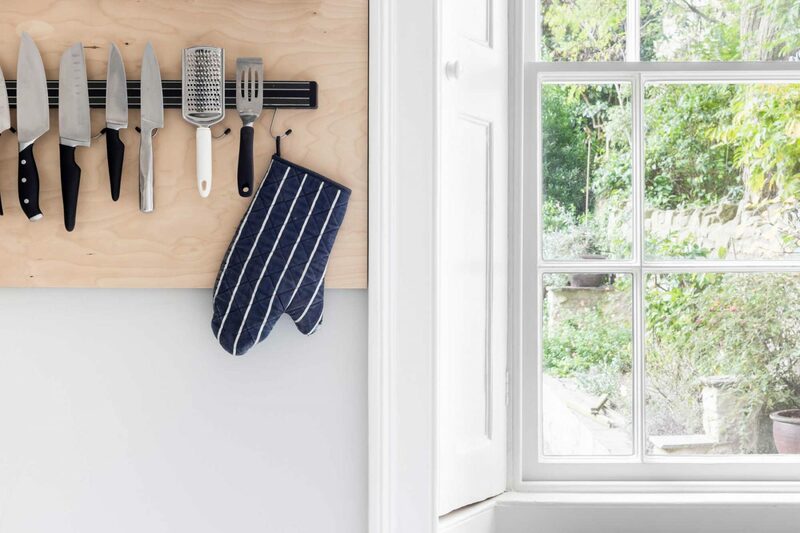 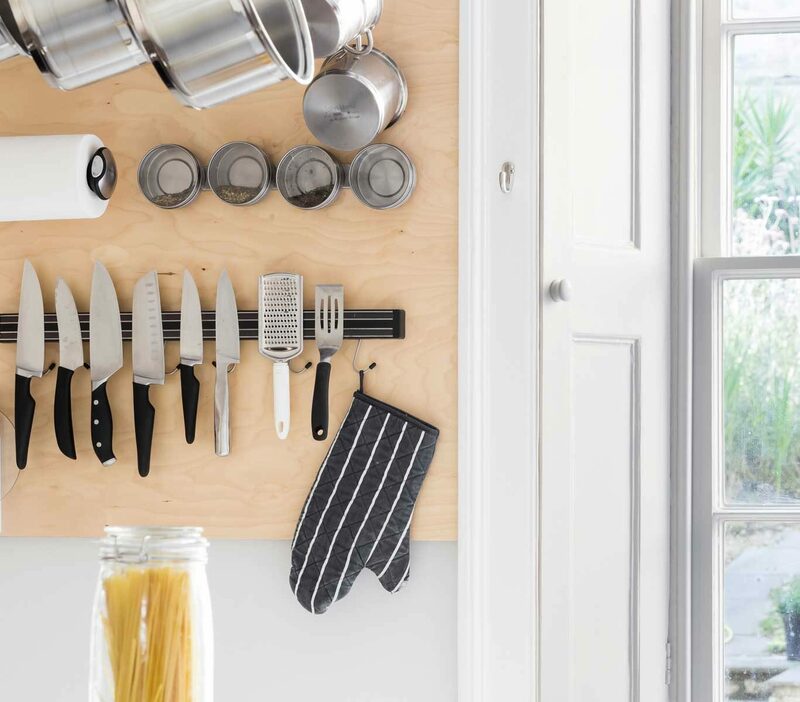 The kitchen cabinets and wall storage unit were handcrafted from birch ply. 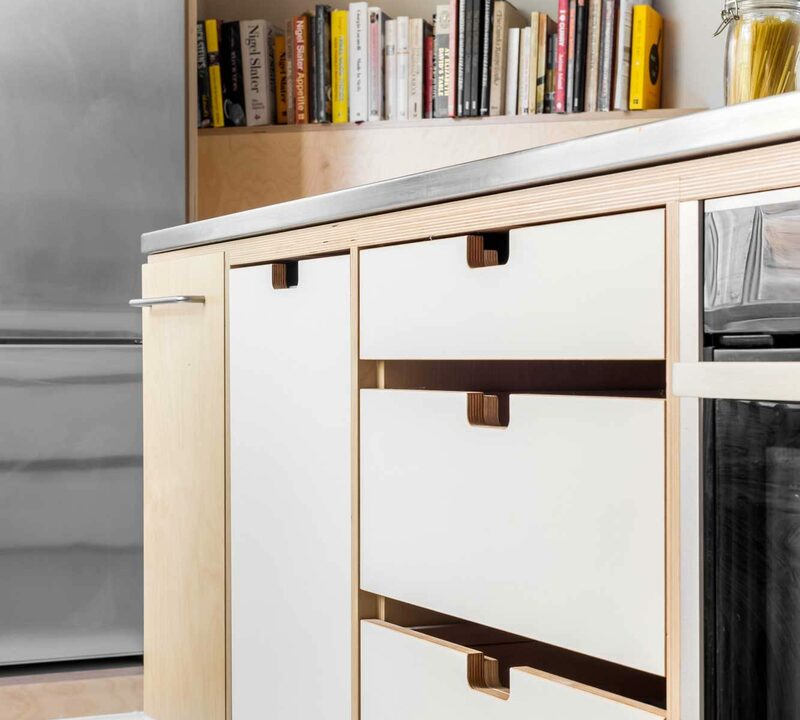 This worked well to add a modern neutral tone that pulled the design together. 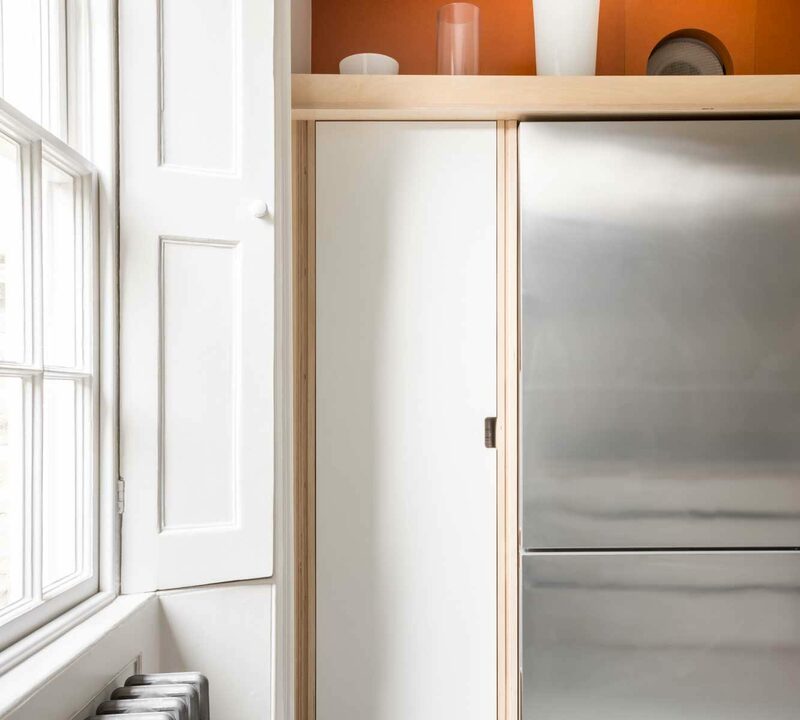 We also crafted several other bespoke storage solutions which worked to increase the functionality and design of the space. 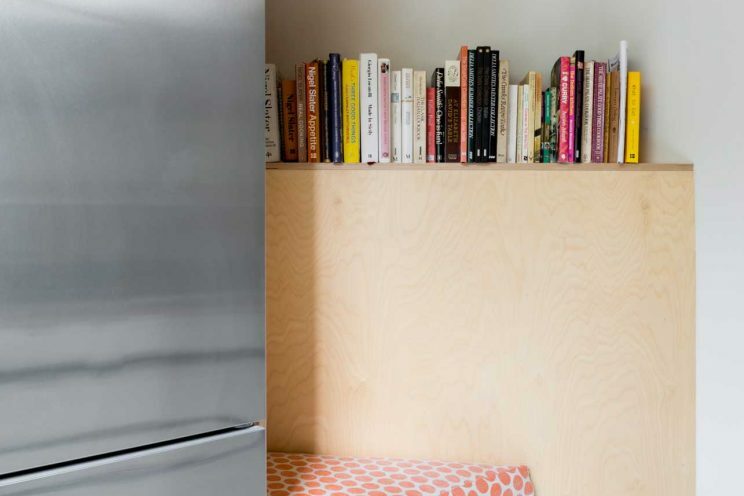 The kitchen island featured incorporated shelving, and we added a neat seating zone with a dedicated bookshelf. 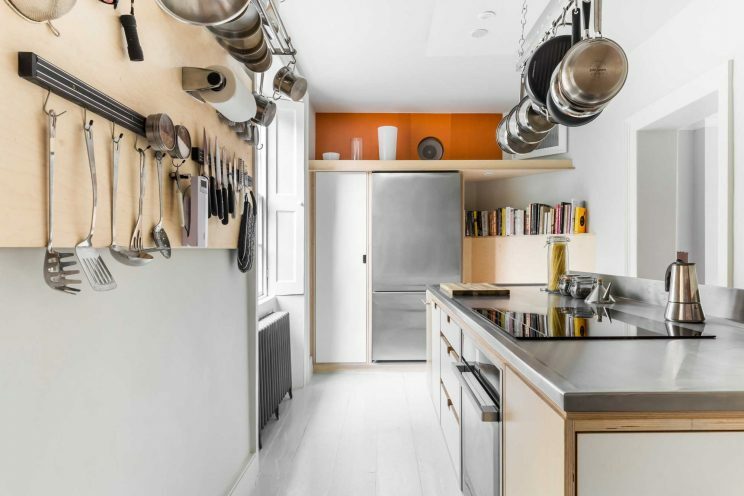 The client also opted for extensive wall and ceiling storage solutions such as the hanging pot and pan rack and the magnetic knife rack. 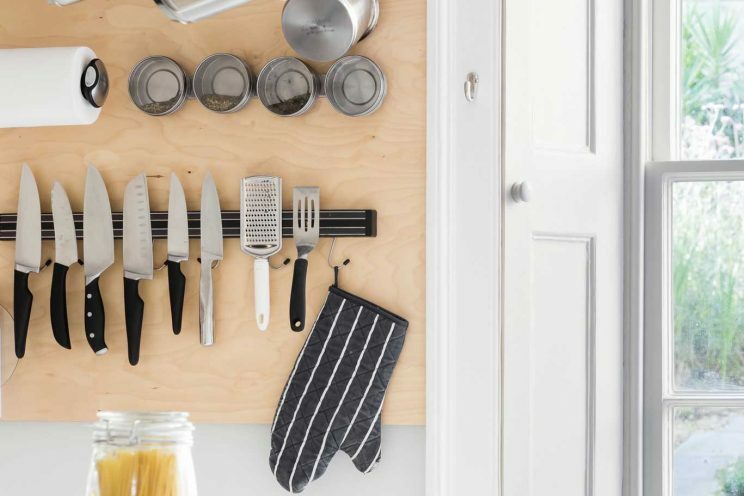 As an avid cook, these provided quick and easy access to his most used utensils. 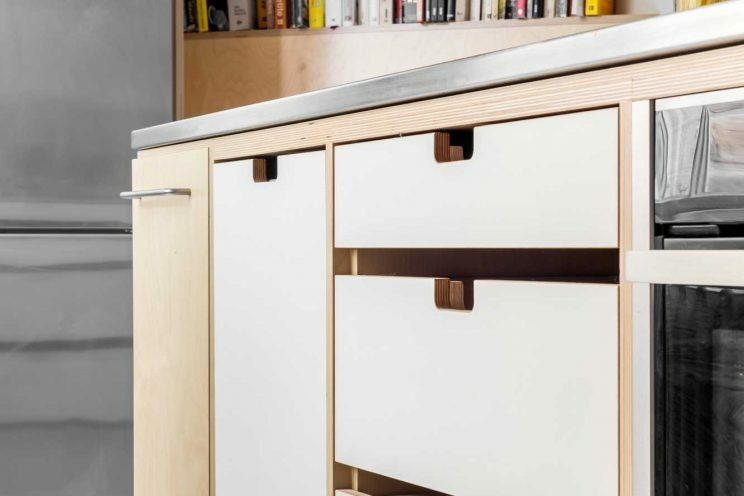 While we also crafted some of the kitchen doors from birch ply, some were crafted using Formica which made for a wonderfully sleek and industrial style finish. 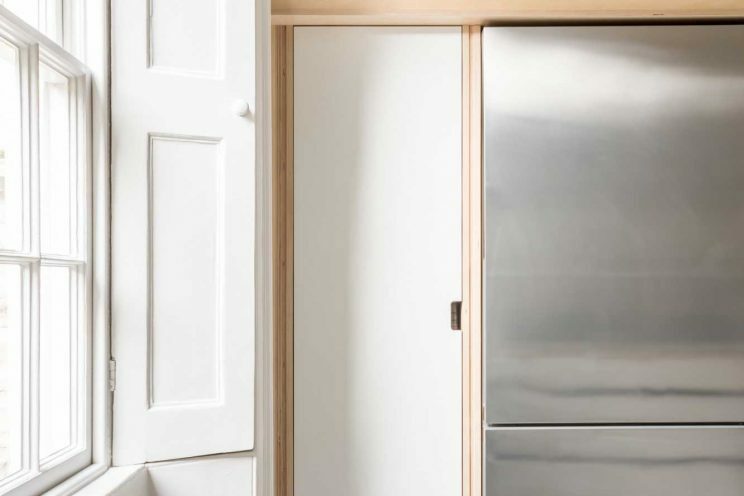 To finish off the kitchen, we also restored the architrave and crafted new doors. 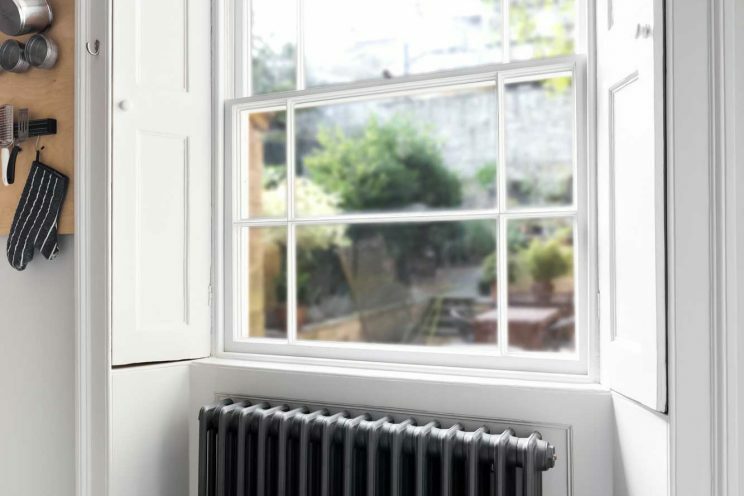 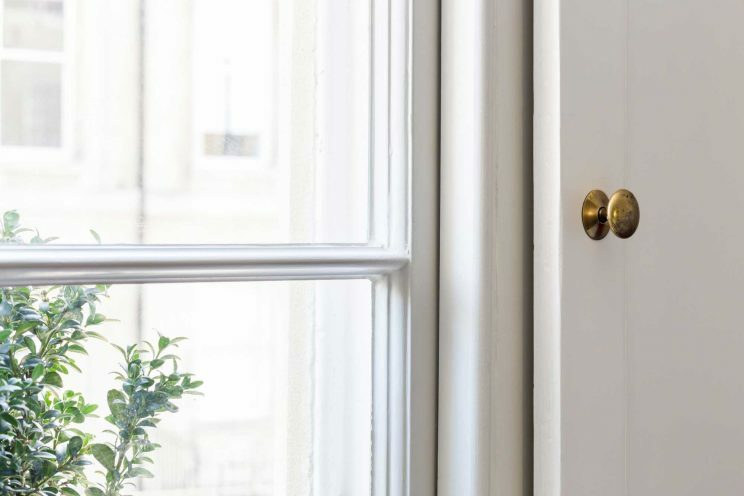 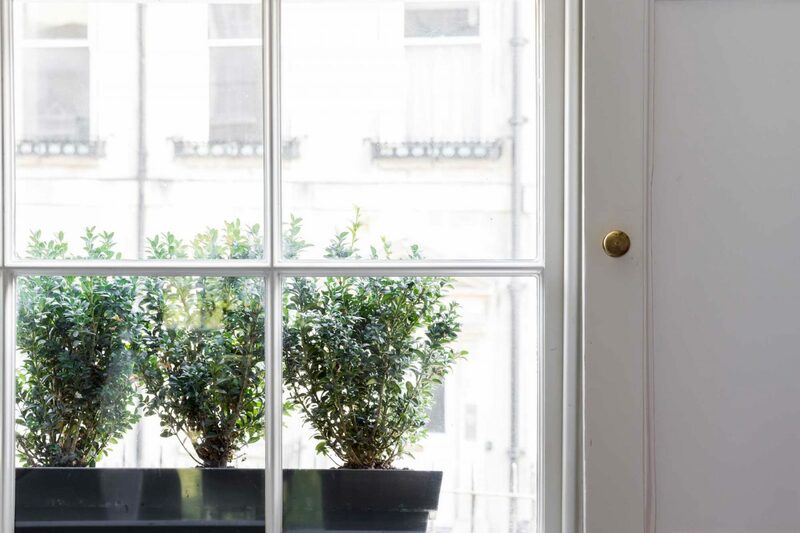 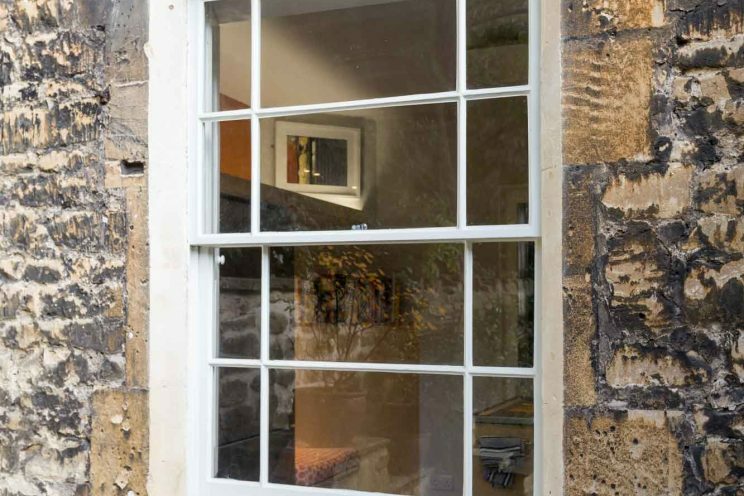 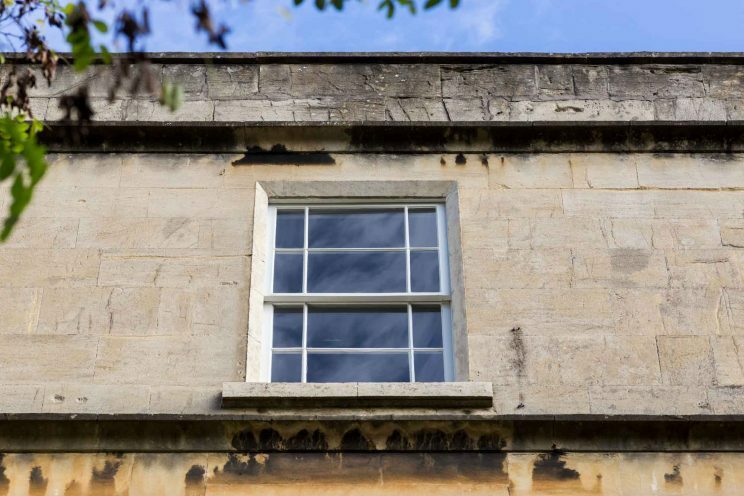 As well as the kitchen project, we were also asked to restore some of the sash windows within his property, manufactured new windows, doors and shutters. 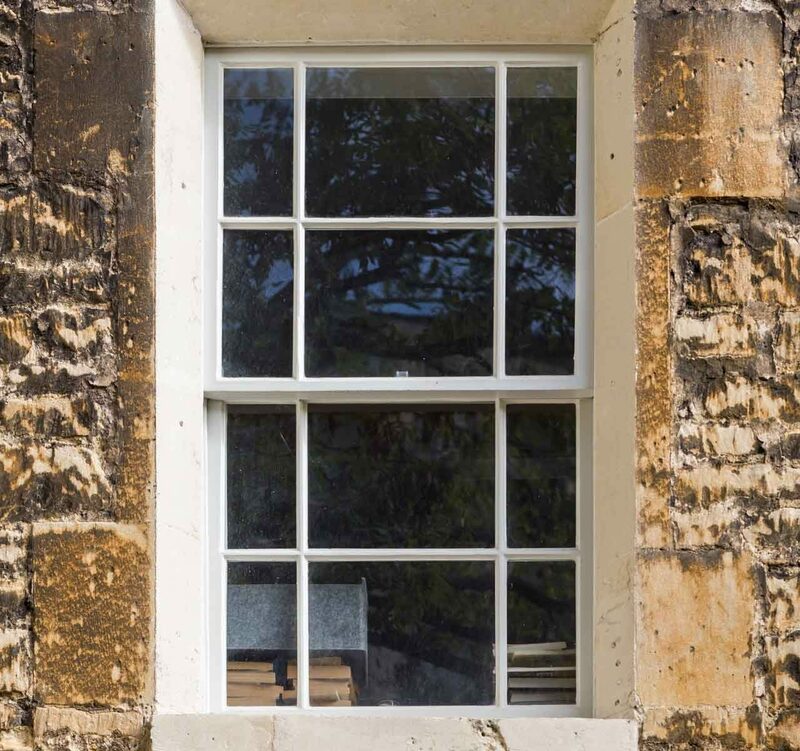 Some windows were in need of a complete restoration, for others we crafted new boxes and sashes using Accoya. 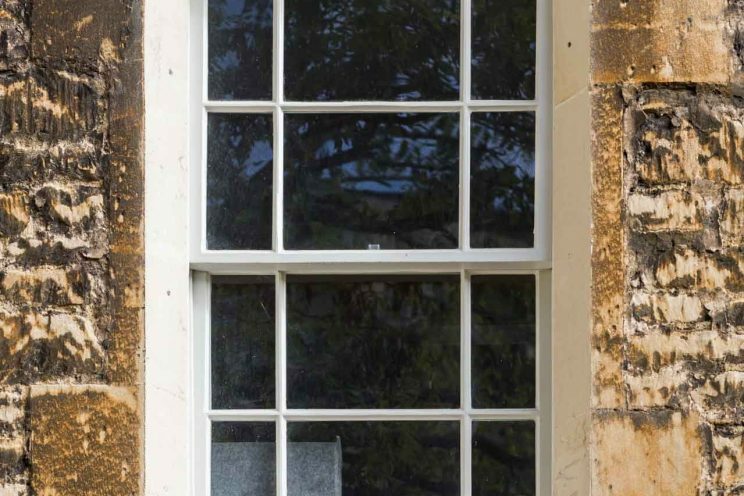 The windows featured a unique six over six pane design, with the middle panes being larger than the others. 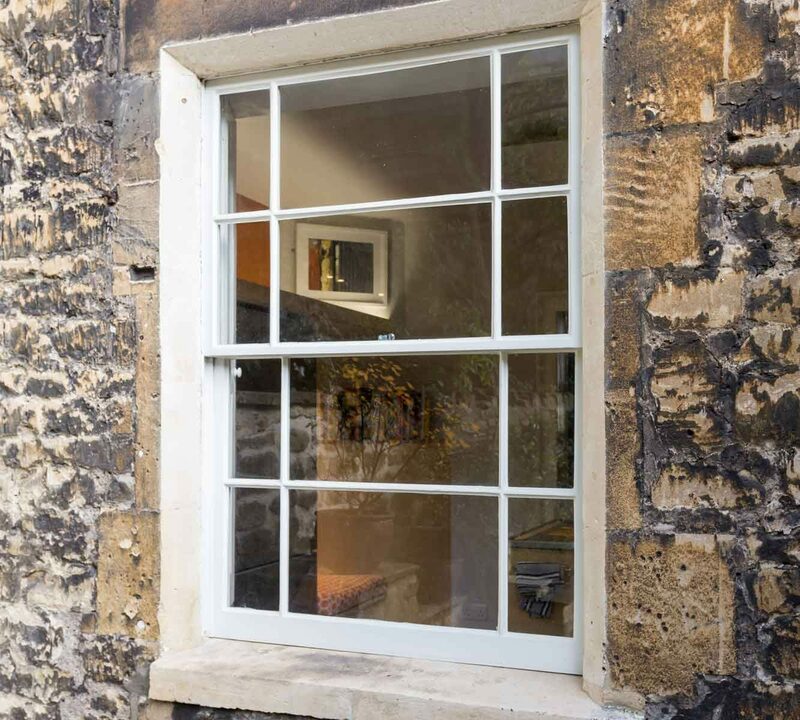 We crafted the sashes to replicate their predecessors and also included our custom draught proofing system. 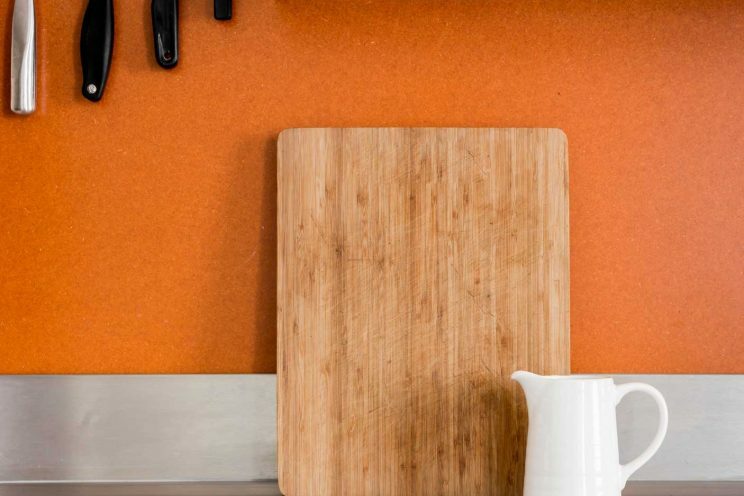 What a really diverse and exciting project to work on! 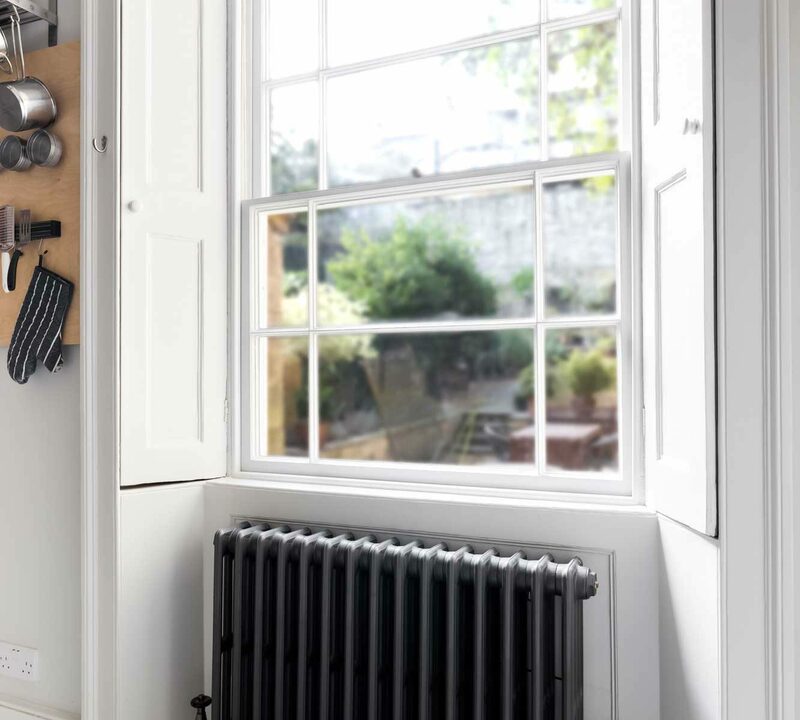 Built in Neff cooker with rack for hanging pots and pans.